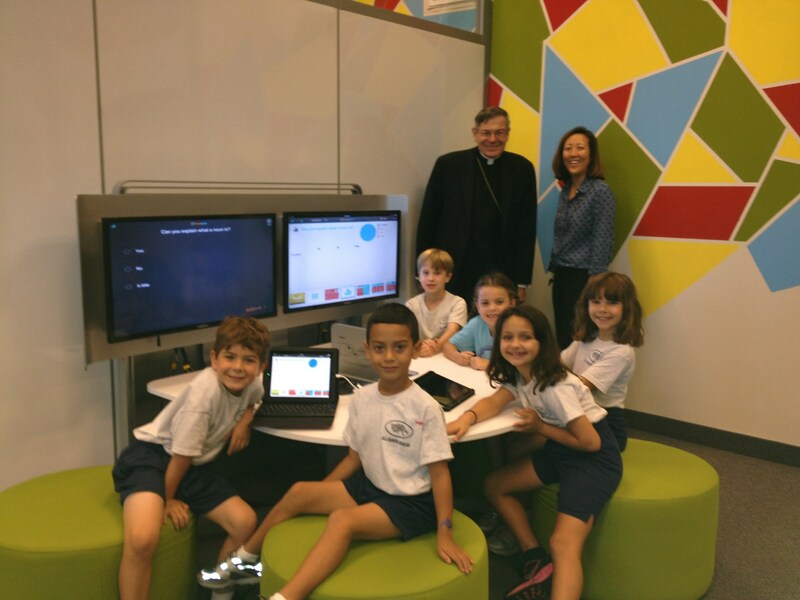 All Saints has once again moved forward in 21st century technology and transformed the learning space. 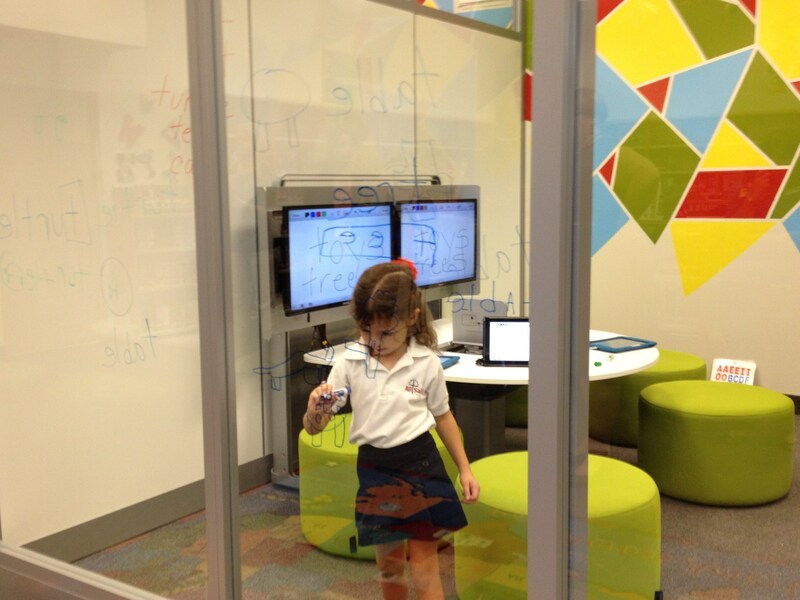 While visiting a school in Miami, Mrs. Broz was impressed with glass enclosed rooms called "media:scape" rooms. 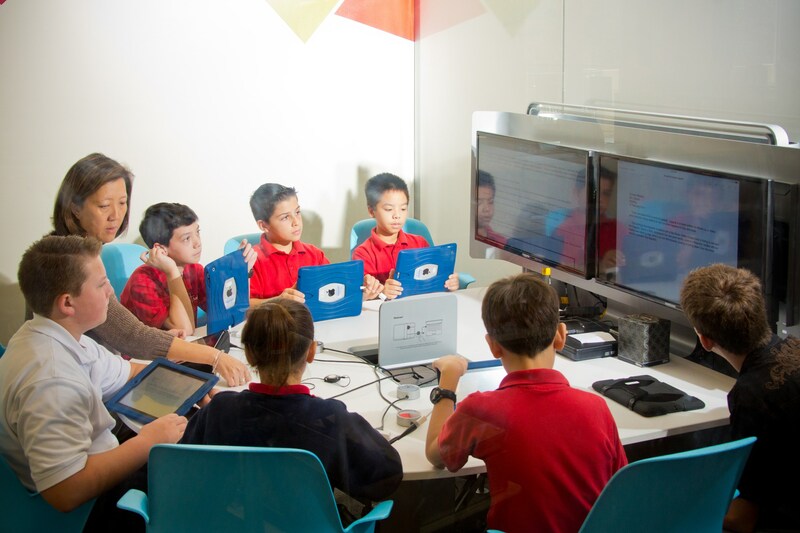 Designed and manufactured by Steelcase, an innovative company from the Think Tanks of Stanford, these classrooms enable students to collaborate, share ideas, and learn more effectively using the tools of tomorrow. 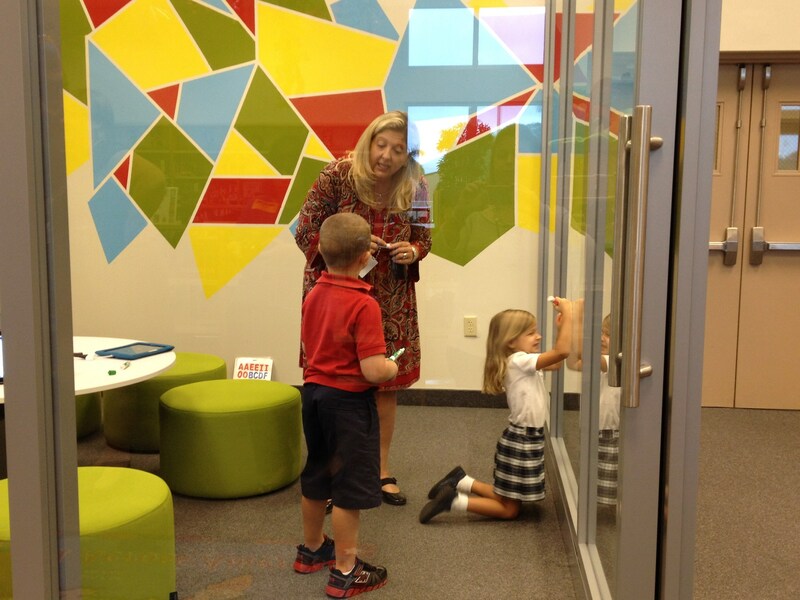 Mrs. Broz researched and later ordered two media:scape rooms to be built in the All Saints Media Center. One room would be used for younger children and the other for upper grades. 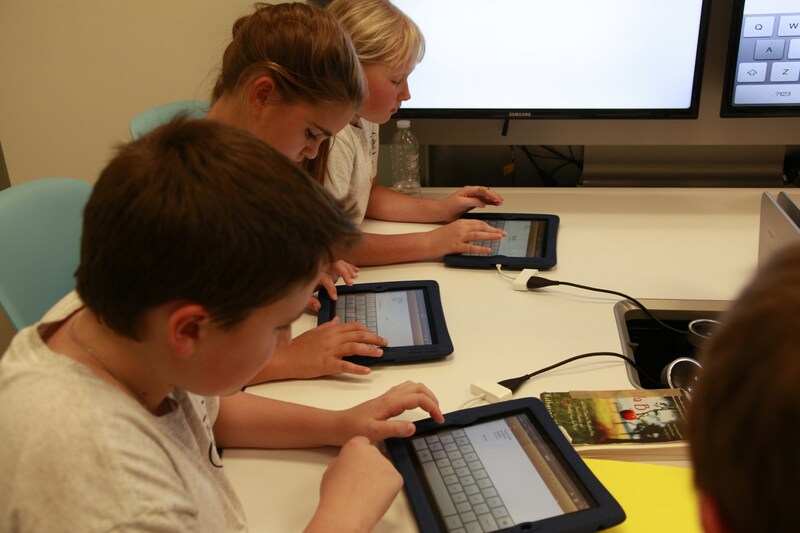 Since the school went 1:1 iPads this school year, the rooms have proven to be a great addition as they are designed to connect the iPads to large screen TV's. In this way, students can share their lessons with the rest of the group and are delighted to see their work up on the large TV screens. 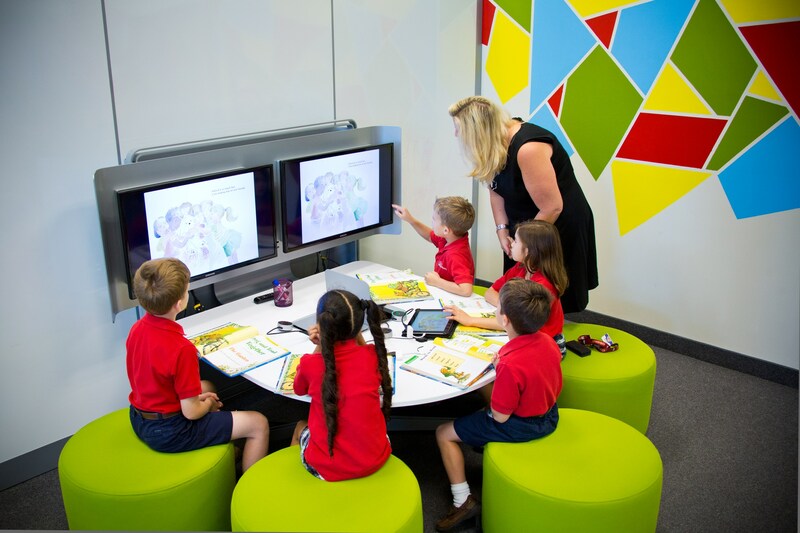 Media:scape merges state-of-the-art furniture and technology to help students quickly and easily share information and become engaged. 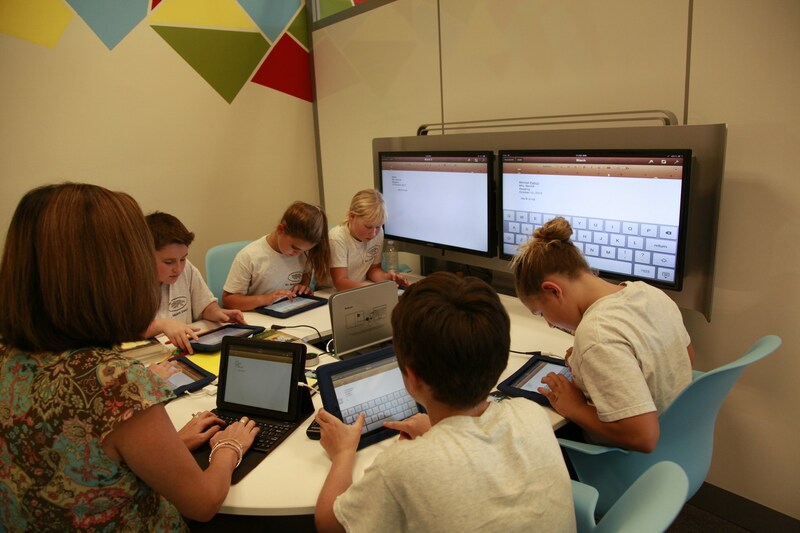 The rooms are designed for groups of 5-7 students and teachers find them very effective when bringing small groups to the Media Center for collaborative work. The students love the rooms as well as the teachers. 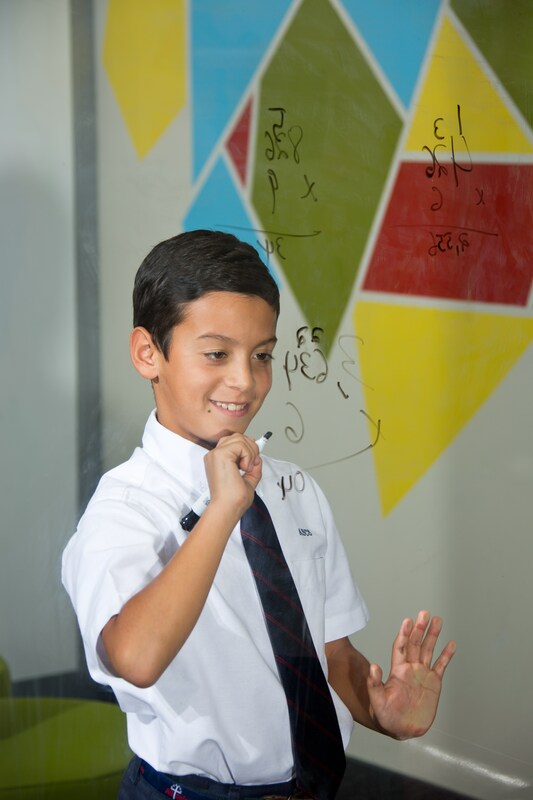 Not only can they collaborate and share ideas using technology but the children can write on the walls as well, sharing their ideas in traditional ways. "My students love working in the media:scape rooms, they look forward to having class there" says Mrs. Berndt, resource teacher. 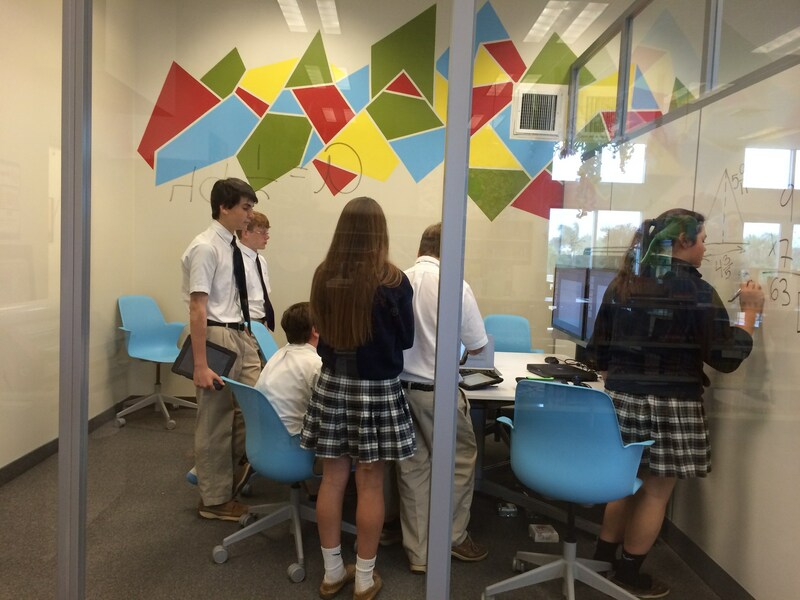 In addition to the media:scape classrooms by Steelcase, All Saints also added a classroom of Node Chairs. Thanks to a donation from the Home & School Association, All Saints was able to purchase a classroom set of Node chairs. The Node chair, by Steelcase, is mobile and flexible. 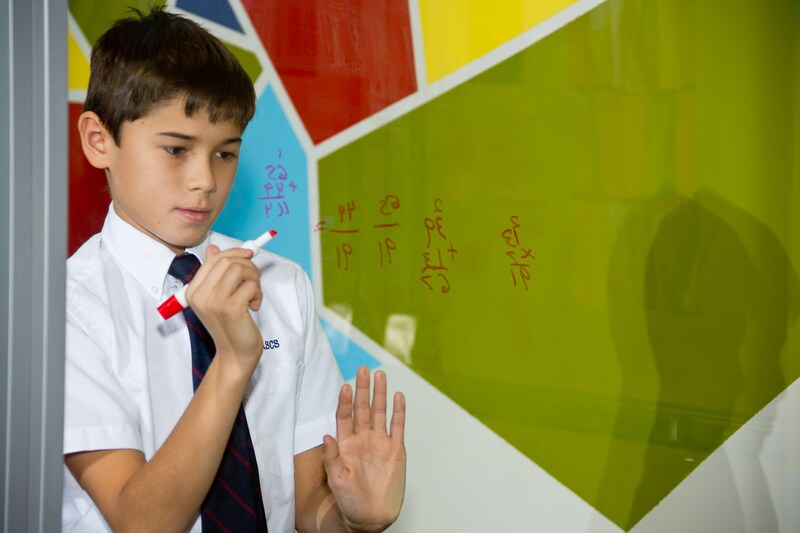 It's designed for quick, easy transitions from one teaching mode to the next. With Node, a classroom can transition from lecture mode to team mode and back again, without interruption. 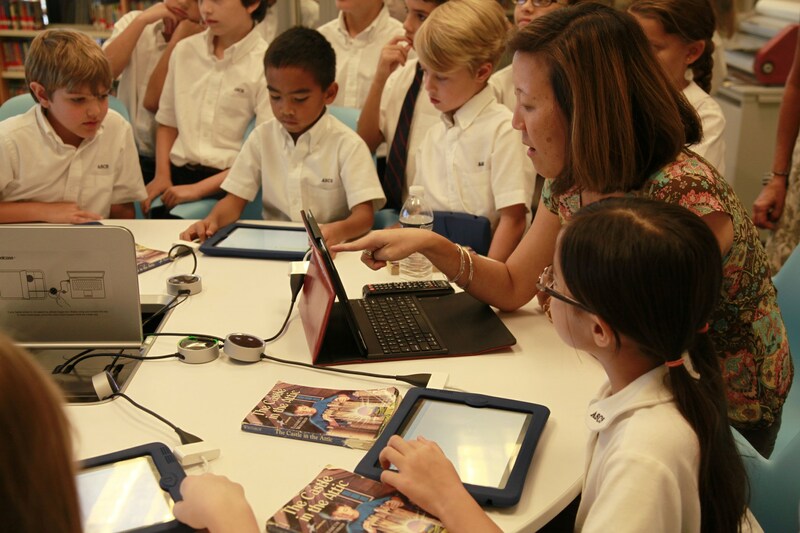 It is just another way that All Saints is transforming learning spaces to better support the integration of technology. All Saints plans to add additional Node chairs in classrooms over time. 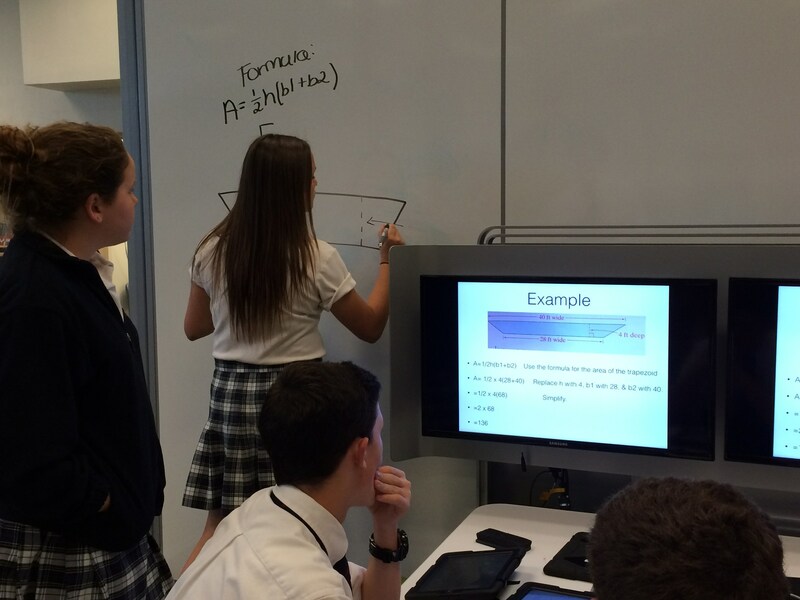 Additional Steelcase "active learning" furniture continues to be added each year. 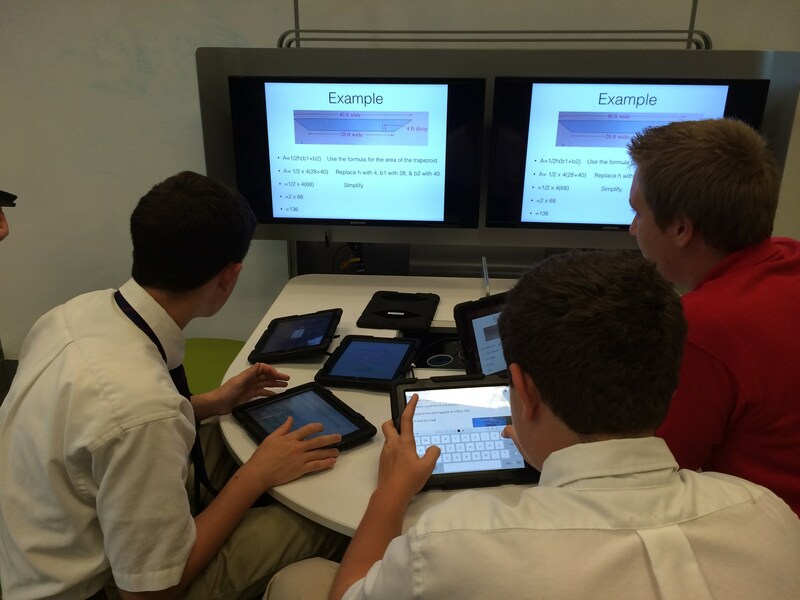 The Media Center was transformed with the addition of large collaborative tables and chairs that can be moved and grouped according the student or teacher needs. 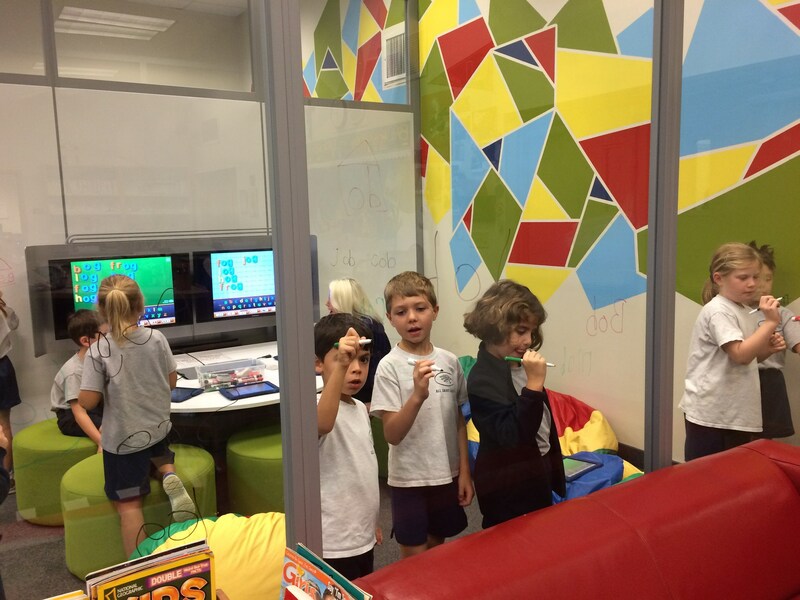 Collaborative reading centers will be added in the primary grades soon.